What do you get if you combine a striped rush, a dark green ‘lily turf’ and a perennial with lime yellow foliage together in a shiny pot? The answer’s easy: a miniature landscape that will uplift your mood, even on the dullest winter’s day! CUPHEA hyssopifolia ‘Lemon and Ice’ PBR is just as pretty as C. hyssopifolia ‘Lemon Squash’ PBR and C. hyssopifolia ‘Cocktail’, two earlier Cuphea releases. 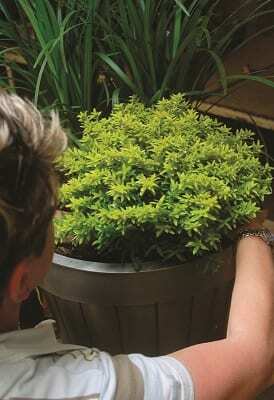 A compact, sun-loving evergreen, it grows to a height of about 30 cm and spreads to about 40 cm. The foliage is a bright shade of lime and lemon yellow and a mass of small white flowers decorate the plant from summer to autumn. It is tender to frost. 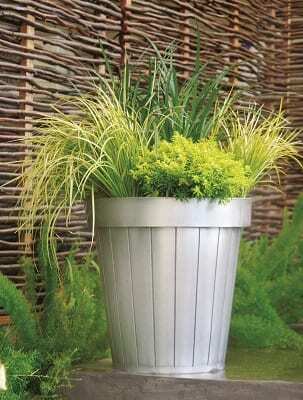 ACORUS gramineus ‘Golden Edge’ is a handy plant with gold to light-yellow and green striped leaves. This evergreen plant can be planted in sun or light shade and it is very hardy to cold. It will also grow happily in water. Strictly speaking LIRIOPE muscari Evergreen Giant’ is not really an ornamental grass, but when you plant great swathes of any Liriope species or variety (there are lots to choose from) you get the same effect as you would when using real ornamental grasses. ‘Evergreen Giant’ is a champion plant that will grow up to 90 cm tall with a spread of 45 cm in ideal conditions and it is hardy to cold. Dainty sprays of light purple flowers appear between the strap-like leaves in late summer to autumn, followed by dark berries. 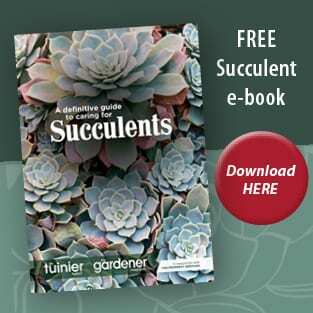 None of the plants we chose were large and few of us have the patience to wait for a great focal point to develop so, when planting up a big pot, it is preferable to buy more than one of every plant variety to get an instantly lush effect. 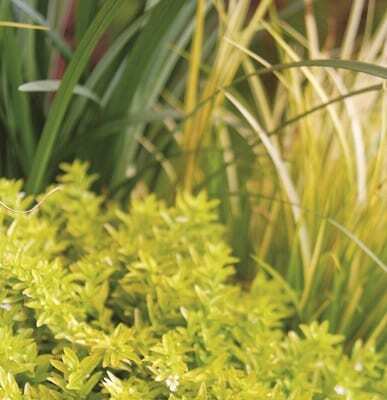 It is easy to divide grasses like A. gramineus ‘Golden Edge’ to increase your stock. Wait until spring, use a sharp hand spade to cut off pieces of the roots or rhizomes and plant the pieces. 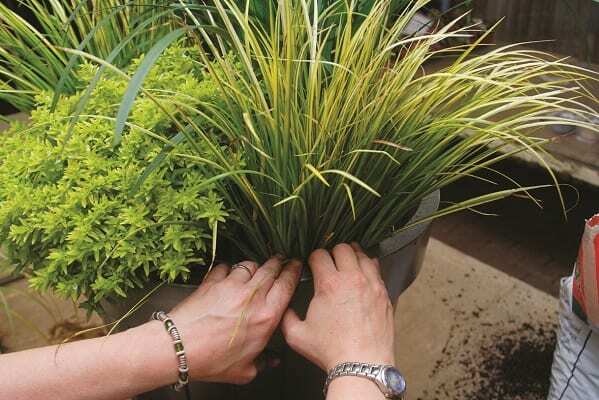 1.When potting up a plant, make sure you use good potting soil. 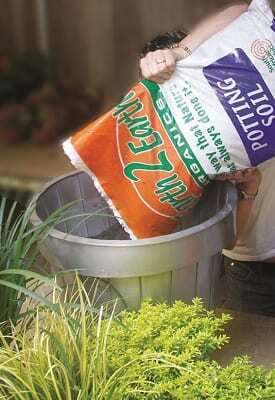 Earth2Earth potting soil is a blend of organic material that is perfectly formulated to give plants the best start. 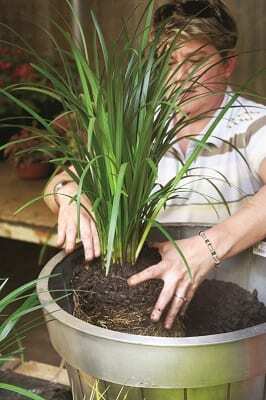 2.Plant the LIRIOPE muscari ‘Evergreen Giant’ first.